For the next installment of the F Spot, I want to focus on someone who I have a massive amount of respect for and someone who champions the working class in every aspect of their lives. On the back of my previous discussion of intersectionality I want to introduce this blog into the realms of class politics as well as gender politics and I can’t think of a more perfect place to start. That person is Jack Monroe- writer, food blogger, political activist and all round outstanding human being. My fondness for Monroe’s work largely comes from the essay “Hunger Hurts” their vivid description of the fear and experience of living in poverty in Britain, while being responsible for a young child, really shone a light on how the lowest paid or out of work mothers have to try and survive. It is a piece of writing which made me cry, think and reevaluate my own views on poverty in this country. Their perspective provides a much needed insight into what it feels like and what needs to change. From this position Jack rose from the ashes of unfairness, she worked, worked and worked to develop nutrious food on a very strict budget, which she turned into a blog This led to the publication of their cook books “A girl called Jack” and “A Year in 120 Recipes. Now Jack has paved the way for outspoken politics which refuses to acknowledge that some people deserve less than others, that those in work are better than those who collect benefits. Their work is centred around giving the people the choice to eat, to the live no matter of your employment status or salary. The speech ‘The Politics of Food” strikes a chord with how we must work to make the world a fairer place, not only through feminism as discussed on this blog but through the challenging and dismantling of social discourse around poverty and what it means to be poor. 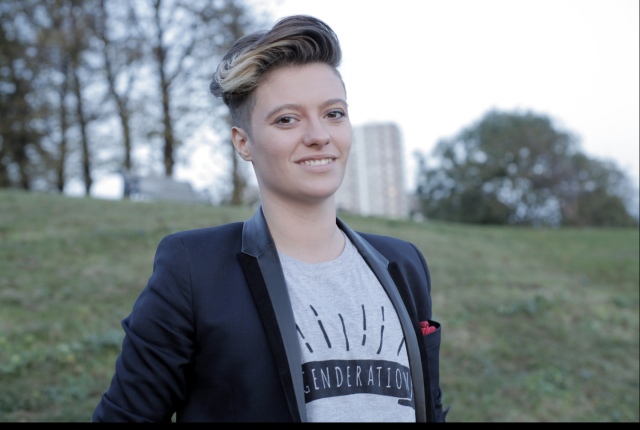 Now as this is a blog focused on Feminism and Gender, I can’t miss out what I see as a pivitol event in how we view issues of gender identity through the bravery of Jack Monroe. Recently Jack wrote a blog post which has jumped into my top favourite ever blog posts – which is something I never thought I would have – her piece “Please don’t call me a girl called Jack, I have something to tell you”. It’s a wonderfully poignant “coming out” post in which they chose to tell the world they are in fact transgender and begining the long journey of transitioning. Now anyone coming out as transgender deserves love and support and recognition, as it is something many people still reject and still want to fight against. But Jack as a prolific activist and writer has the platform to reach people who didn’t know they had a role model. Jack’s transition can tell us lots of things about being trans, but most important is the fact trans doesn’t have to mean male-to-female or female-to-male, it can encompass a whole range of things. As Jack so cleverly and articulately introduced lots of people into the world of the non-binary. Those who identify as non-binary identify as something outside of the ‘traditional male and female’ so that may mean they feel somewhere in the middle, or some days they identify as a man and some a woman, or they may not identify as anything at all. By giving a prominant face to the non-binary community Jack is probably unknowingly providing a lot of underrepresented people, a person they can identify with and a person they can use as an example to help understand their own experience. This prominent transition also gives us a key insight into how journalism needs to adapt to covering transgender issues, Jack has faced deadnaming, misgendering and a whole lot of disrespect in both the time before and after her announcement. By using their previous name and showing a clear reluctance to use the correct pronouns many journalists have been undermining Jack’s very existance and experience. So to combat this Jack has gallantly began to challenge the way media organisations report trans and non-binary people by legally challenging disrespectful publications. Not only this she has created a useful tool for journalists while discussing her, as a Journalism student this means a lot to me. As I never want to slip into a place where I misgender or dead name a trans person as it undermines their whole journey and discounts thier experience. So as an admirer of Jack I say thank you. For allowing me to educate myself through your work, by publishing a handy infographic from All About Trans, she highlights the work still to be done to ensure issues of gender are reported in the right way. To wrap up what has been an all round love-fest for Jack, I’ll leave you with a piece from an interview on food banks for 2 years ago.